Virunga National Park, home to the world’s largest population of mountain gorillas, is plagued by deforestation linked to the production of charcoal for cooking fuel. But local and international groups are working on several fronts to find sustainable alternatives. On the wooded outskirts of Virunga National Park, a truck lumbers down a deeply rutted dirt road. The vehicle sags and sways precariously under the weight of its illegal cargo: enormous sacks of charcoal. In the eastern portion of the Democratic Republic of the Congo, most charcoal is made from trees illicitly harvested from Virunga, Africa’s oldest national park. Covering 3,000 square miles, Virunga is also a UNESCO World Heritage Site and home to some of the world’s last mountain gorillas and other rare wildlife and plants. Yet it is common to see trucks, bicycles, and carts laden with bulging bags of carbonized wood leaving the park and heading to market. 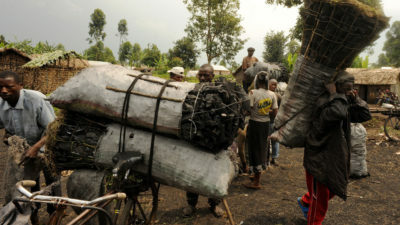 Nearly all of the 5.8 million people in the surrounding province of North Kivu rely on charcoal for cooking fuel, since few have access to gas, electricity, or other fuels. An estimated three-quarters of that charcoal is made by cutting down Virunga’s trees and slow-baking them for days in dirt pits. Charcoal burns longer and hotter than wood and with less smoke. The impacts on the environment in Virunga are significant, as deforestation dries out the forest, causes erosion and landslides, and eats away at wildlife habitat, including woodlands that are home to an estimated 400 to 500 mountain gorillas — roughly half of the global population. The Virunga region is a hotspot for deforestation; the non-profit, Global Forest Watch, used satellite images to estimate that the park lost 24,378 hectares of forest (94 square miles) from 2001 to 2014. Finding alternatives to conventional charcoal is key to preserving the Congo’s forests, wildlife, and environment. Finding alternatives to conventional charcoal is thus key to preserving Virunga’s — and the Congo’s — forests, wildlife, and environment, as well as to boosting the local economy. Several local and international groups are working to achieve that goal. These initiatives include making charcoal in a more sustainable way by cultivating tree plantations, introducing better production techniques, and supplying more efficient cookstoves. A plan to harness small hydropower aims to reduce dependence on charcoal by supplying clean electricity for cooking. Like so many of sub-Saharan Africa’s environmental problems, the felling of trees for charcoal in Virunga is partially the result of swelling populations in need of energy. The population of Goma, the capital city of North Kivu province, has increased from 150,000 in 1990 to more than 1 million today. (In that time, the population of the Democratic Republic of the Congo has more than doubled, from 35 million to 79 million.) The African Conservation Fund estimated that in 2008, Goma’s residents were burning about 59,000 tons of charcoal annually. Now, consumption has doubled to 116,000 tons a year, according to WWF. Virunga covers an area double the size of the state of Rhode Island and is difficult to patrol. With a host of other problems, including life-threatening attacks from rebel groups, stopping the majority of the population from using charcoal has proven to be unrealistic. The park’s guards — 160 of whom have lost their lives in more than a decade of civil strife in eastern Congo — are often focused on higher priorities, such as protecting the endangered population of mountain gorillas. The $35 million underground charcoal business helps fund rebel militia groups that operate in Virunga. The illegal trade in charcoal not only threatens the environment. The $35 million underground business helps fund rebel militia groups that operate in Virunga, exploit its resources, and terrorize locals. Since 1996, the region has been wracked by conflict involving Congolese forces, anti-government rebels, and militia from Rwanda and Uganda. Approximately 5.6 million people have died in eastern Congo, victims of the deadliest conflict since World War II. In 2007, WWF started a sustainable charcoal program in the region, with support from the European Union and the Netherlands, as well as help from local community groups. The initiative trained farmers to cultivate fast-growing trees such as eucalyptus. WWF grew tens of thousands of seedlings and distributed them free to farmers to grow on plantations. As of 2015, more than 21 million trees had been planted around the park, according to WWF. 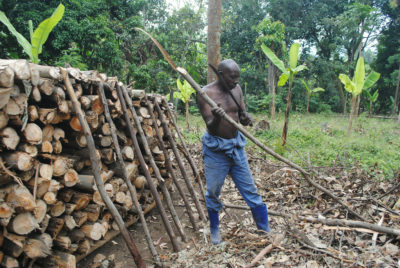 In the next few years, 22,000 acres of reforested land could supply up to 20 percent of Goma’s annual charcoal demand. WWF has trained more than 9,300 small farmers to produce charcoal using these techniques, which carbonize wood more quickly and efficiently by stacking it in a way that allows better air circulation in its center. Bahati Bahobwerhe has been making charcoal for 26 years. Before, he would burn wood in a dirt-covered pit for one week. “There was a lot of waste in the old method,” he said. He estimated he made seven bags of charcoal per week using the old method. Using the new method, he makes 26. But the eco-charcoal program faces obstacles, including lack of knowledge about local tree-growing and poor land management. The supply chain and market for eco-charcoal are nascent. And it’s difficult to teach entrepreneurship to farmers in a region ravaged by violence for more than two decades. In conjunction with the charcoal program, WWF is teaching locals, including many women, how to make and sell efficient cook stoves using widely avaialable materials like clay and sheet metal. The stoves burn half the amount of fuel used in conventional models. Some 76,000 are in use so far in North Kivu. WWF estimates efficient cook stoves have saved about 60,000 tons of charcoal since 2010. Adeline Kahindo Tsongo, 53, is head of a women’s group in Goma that makes stoves and sells them for about $1 each. That provides Tsongo with an income of up to $400 in a year, which pays for food, school fees, and other expenses. Three of Tsongo’s children are now in university. 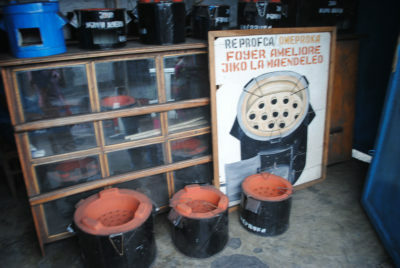 The Virunga Alliance, a public-private affiliate of the national park, also has launched an effort to bring hydropower to the region to run electric cookstoves that will replace charcoal ones. The group is building micro-hydroelectric power plants — small “run-of-the-river” installations that do not require dams. To encourage people to cook with electricity rather than charcoal, the Virunga Alliance plans to give 12,000 free electric burners to rural families. “We’re trying to slow down pressure on the land,” says one official. Two micro-hydropower plants are already running, and there are at least two more planned. The first was a small pilot project funded by the European Union outside the park’s northwest border. The second is a much larger plant that can generate about 13 megawatts of electricity. It started operating in December 2015 after two years of construction in the southern town of Matebe. In a village near Matebe called Ruchiro, new public streetlights illuminate dirt roads at night. As of this spring, 3,000 households had paid to connect to Matebe’s electricity. In the troubled Virunga National Park, a battle over oil exploration. Read more.